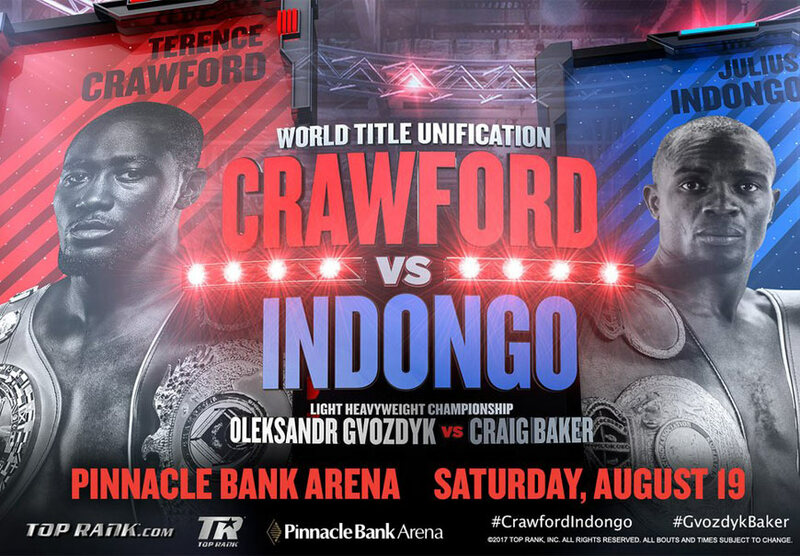 Terence Crawford faces off tonight with fellow two-belt world titleholder Julius Indongo, of Namibia, at Pinnacle Bank Arena in Lincoln, Nebraska, a short drive from Crawford’s hometown of Omaha. Crawford-Indongo will be only the fourth fight in the four-belt era in which all four major titles will be on the line in the same fight; the winner will walk away as the undefeated, undisputed No. 1 fighter at 140 pounds. Crawford (31-0, 22 KOs), 29, was the 2014 consensus fighter of the year when he won the lightweight title from Ricky Burns in Scotland and then made two successful defenses in Omaha against Yuriorkis Gamboa and Ray Beltran. In 2015, he won a junior welterweight title and has made five junior welterweight title defenses, including unifying two belts by lopsided decision against Viktor Postol last July and stopping former Olympic gold medalist Felix Diaz in the 10th round on May 20. Now he will attempt to unify the four belts against Indongo (22-0, 11 KOs), 34. who will be making his second title defense while also trying to gain all four belts. Indongo, who fought his first 20 fights in his home country, then traveled to Moscow and spectacularly knocked out hometown hero Eduard Troyanovsky in the first round in December to win one title. Then he traveled to Ricky Burns’ hometown of Glasgow, Scotland, and easily outpointed him to unify two belts on April 15. Now he is going to Crawford’s home area looking to add the other two belts to his collection. “The fact that we were able to secure this for all four belts is truly history-making,” Top Rank vice president Moretti said. “Both sides deserve credit in their willingness to do this. I’d like to thank [Indongo co-promoters] Eddie Hearn [of Matchroom Boxing] and Nestor Tobias for truly wanting to make this fight. Only three times previously have all four major belts — the WBC, WBA, IBF and WBO — been at stake in the same fight: once in 2004, when Bernard Hopkins put his three belts up against Oscar De La Hoya’s one and knocked him out to unify the middleweight division, and twice in 2005, when Hopkins retained them by outpointing Howard Eastman and then lost them by decision in his first fight with Jermain Taylor. The Canelo Alvarez vs. Gennady Golovkin middleweight championship showdown was always a matter of “when,” not “if.” The timing just had to be right. Canelo had never fought above 155 pounds, five fewer than the middleweight limit. He wanted just one fight at 160 or above to acclimate himself to the new division, which turned out to be his meeting with Julio Cesar Chavez, Jr. in May. Immediately after Canelo dominated his countryman en route to a shutout decision, standing in the ring, he made the announcement with Golovkin on hand. “GGG, you are next my friend. 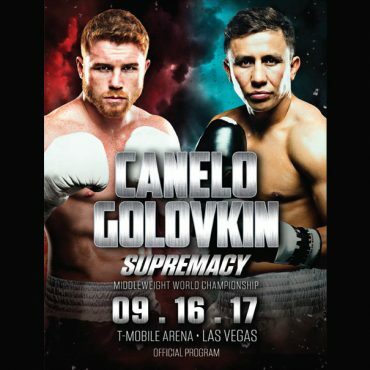 The fight is done,” Canelo bellowed, eliciting wild cheers from the 20,510 at T-Mobile Arena in Las Vegas and making waves worldwide. Canelo was ready, which might not have been the case even a year and a half earlier. The weight was one issue, but there were others. Golovkin appeared to be all but unbeatable when talk of a fight with Canelo first surfaced. The one-time amateur star from Kazakhstan was a complete, experienced fighter with crushing power, as his 23-knockout streak indicated. Meanwhile, Canelo also was on a roll – including a wide decision over Miguel Cotto to win the WBC, RING and Lineal Middleweight titles in November 2015 – but, still in his mid-20s, he had yet to reach his peak. A lot has changed. Golovkin showed signs of vulnerability before he stopped Kell Brook last September and then struggled to get past talented Daniel Jacobs in March, winning a unanimous, but close decision that made him look human. At the same time, Canelo, now 27, demonstrated against Cotto, Amir Khan, Liam Smith and Chavez, Jr. that he was getting better and better each time out. In particular, he had refined his boxing skills, making him a more-complete fighter. Thus, the perception of the fight also has evolved. Had it happened immediately after the Cotto fight, Golovkin would’ve been a prohibitive favorite and the matchup would’ve been less interesting. Now it’s essentially a 50-50 fight. Many experts are even picking Canelo to win. That’s why the timing for the fight seems to be perfect. 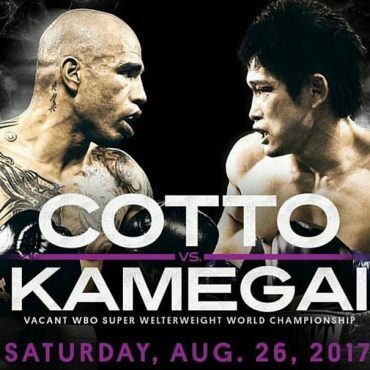 Miguel Cotto (40-5, 33 KOs), the only four-division world champion in the rich boxing history of Puerto Rico, returns to the ring tonight to take on the always-exciting Yoshihiro “El Maestrito” Kamegai (27-3-2, 24 KOs), of Japan, for the vacant WBO Junior Middleweight World Championship. Cotto, 36, will attempt to secure a sixth world championship in four weight classes as he makes his 23rd appearance on HBO. Twenty-four of his last 25 fights, dating back to 2004, have been for world titles. The surefire, first-ballot Hall-of-Famer, has held world titles in the junior welterweight, welterweight, junior middleweight and middleweight divisions and has faced a who’s-who of elite fighters over the last 15 years, including Floyd Mayweather, Manny Pacquiao, Canelo Alvarez, Sergio Martinez, Antonio Margartio (twice), Shane Mosley, Paulie Malignaggi, Ricardo Mayorga and Zab Judah. Kamegai, 34, has been involved in several action-packed fights, including a controversial decision loss to former titleholder Robert Guerrero in 2014 and in his last two fights, a hellacious draw with Jesus Soto Karass last April and an eighth-round knockout of Soto Karass in the rematch in September. The fight will mark only Cotto’s second fight in the Los Angeles area during his 16-year career. He boxed at Staples Center on a Roy Jones undercard in his sixth professional fight in 2001.